Back in 1896 the organizers of the Olympics came up with the idea of a long distance foot race. The idea was transplanted by some Bostonians and they've been holding the Boston Marathon since 1897. San Francisco has its Bay to Breakers. But The City also hosts an amazing annual wine tasting competition organized under the auspices of Anthony Dias Blue, wine editor of Bon Apptit magazine. "Andy" runs a terrific event. Well, he thinks he runs it, but it's really coordinated by a delightful woman named Carol Seibert and a cast of about a thousand volunteers. These people manage to organize, and I mean organize, approximately 35-40 wine judges from around the country and the pouring of something like 3,800 wines for evaluation by the various panels. Then they manage to tabulate the results, an even more Herculean task! The judges are invited to a dinner on Friday night and it's a good opportunity to renew old acquaintances and make new ones. We're "treated" to wines from a winery who entered a bunch of wines the previous year and whose wines fared well. I cheated and brought some bottles in my "traveling cellar" bag, much to the delight of some of people sitting at my table. The food is nice, but it's really the people that make this a memorable event. 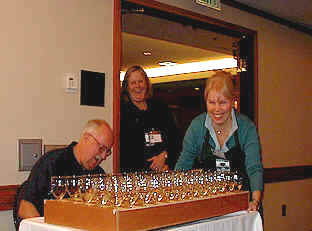 The judges are organized into panels of three or four. Some panels have been tasting together for many years. Others are thrown together for the first time. Some people are invited year after year. Others are, as Andy said about someone last year, "voted off the island." The volunteers are amazing, devoting, essentially, a wasted weekend to schlepping carriages full of wine glasses, each coded to a particular wine. Keeping track of the results is a monumental task. So is washing thousands of wine glasses! Somehow these people manage to smile through the whole event. We don't know who made the wines, where they come from or how many arms & legs the winery is asking for these. Sometimes we'll hazard a guess about the origins of a wine. The volunteers were impressed that I correctly nailed the origin of a Chardonnay we taste. I said it was from Long Island. Keep in mind a broken clock is correct twice during the course of the day. You'd think that if a winery is sending a five bottles of a particular wine, plus $60 for the privilege of having their vinous nectar sipped and spit, they'd be sending something of reasonably good quality. We taste quietly and independently, each judge deciding if a wine is worthy of some sort of citation such as a gold medal, silver medal, bronze medal or a "better luck next time, thanks for playing." I have another level of quality called "STW." That means "Shoot The Winemaker." Some people must be drinking too much of their own stuff to realize the swill they've entered has all the perfume of a horse stable that hasn't been cleaned out in a month, not to mention a flavor that could send less hardy tasters into a raging fit. When you're tasting 159 in a day as we did, you have to pace yourself. The spit bucket becomes your best friend. Gold medals are hard to come by. 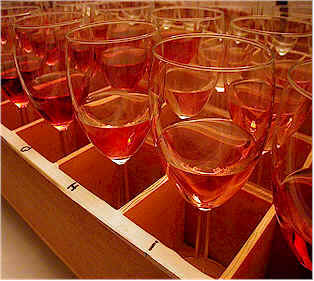 Getting several panel members to agree to award a particular wine is difficult. On those rare occasions when everyone at the table judges a wine to be worthy of a gold medal, the wine is distinguished as a "Double Gold Medal" winner and is tossed into the "Best of Show" Sweepstakes award. One nice feature of this competition is that the judges are not required to award medals, nor are they required to by-pass worthy wines. We tasted flights of 15 wines, for example, and awarded 7 or 8 medals in a few of them. Of course, in some flights we were quite disappointed by the quality and did not award any medals. So, in fact, we are not looking to select the best wine in a flight. If a bunch of wines are worthy, they get citations. 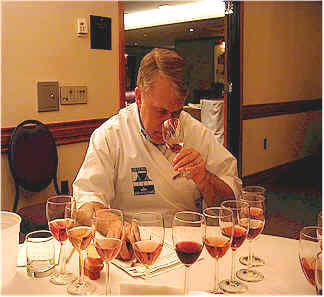 If the judges feel the wines are not good, they don't have to make an award. 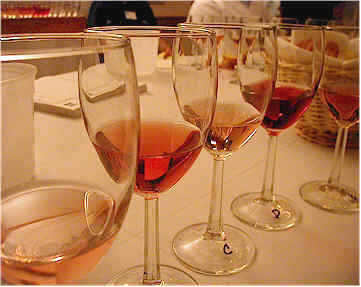 Keep in mind that a wine's showing depends upon a variety of factors. 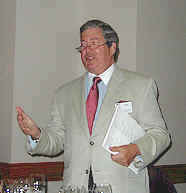 Its placement in a "flight" of 10-15 wines can even influence how it appears to the judges. Here you can see the famous Greg Tresner of May Elaine's in Scottsdale, Arizona. He must have a good palate and a good temperament! He handles a staff of five sommeliers (these sort of people always have an opinion, maybe two) and holds the title of Master Sommelier. That designation is akin to having a "black belt" in karate, but less messy (generally). You can take notes, if you like, on the score-sheets provided. You accumulate a bunch of these papers over the course of the day. 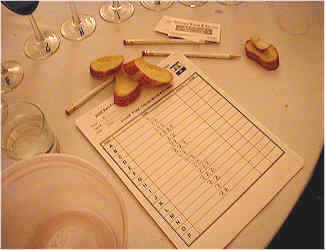 And you don't know the identity of the wines you've tasted until the results are tabulated a month after the event! At the end of the first day we'd tasted some 159 wines! Our panel had the dubious "honor" of tasting some fruit and grape "flavored" wines. I wondered whether or not Greg or Claudia (or myself) had offended one of the organizers to have this, ahem, honor. We tasted a wine made of "Choke-cherries," along with a concoction that was "90% white wine & 10% Nectarine." I can tell you, the white wine must have been awful and the nectarines weren't much better. A White Zin which was supposedly "enhanced" with something must have been inadvertently blended with chlorine. Either that, or they washed the fruit with bleach! Anyway, too bad we had only Semifreddi French Bread as a palate cleanser. We'd have been better off with a plate of Starburst Fruit Chew candies! After tasting this curious flight of wines, I wondered if some inmates at San Quentin hadn't pooled their resources and sent in the entry fee and five bottles of their finest creations for inclusion in this round of tasting. Sunday morning, bright and early, we return for the second half of our mission.